Across global mainstream stocks, bonds and property shares (known as Real Estate Investment Trusts or REITs for short). Across the global stock markets to avoid overreliance on any one, individual country. Multiple sources of return premia such as value and small market capitalisation. Diverfication across mainstream asset classes has been described as the closest thing to a ‘free lunch’ in investment management. Our approach to diversification comes from a sense of deep respect for the unpredictable nature of the capital markets. We acknowledge that we are unable to predict how each asset class will perform in any given year, after all, the markets have no respect for the number of days it takes the earth to go around the sun! 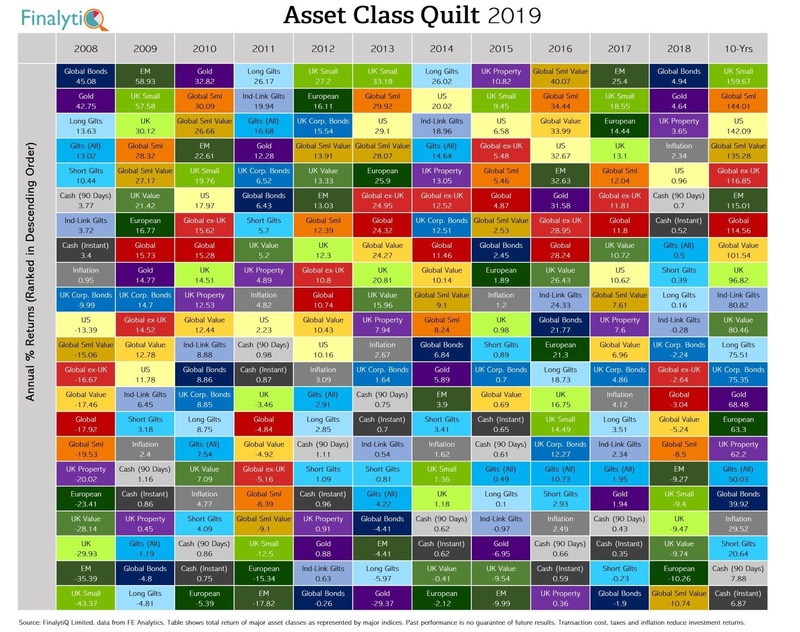 To illustrate this, the following chart shows the highest returning asset classes for each of the last 10 years and the highest returning asset classes cumulatively over the past decade. The inconsistency of the colour pattern and thus asset class returns, illustrates the uncertainty surrounding adopting country-specific risk and the lack of predictability that a particular asset class will perform well each year. A consequence of our global market cap weighting is that only 6% of our allocation to equities is invested in the UK. This reflects the fact that the UK stock market only accounts for around £2 trillion (or 6%) of the £38.3 trillion invested in global stock markets as of the end of 2016. This is in contrast to the investment strategies of many UK-based investment managers, who may allocate as high as 20% of their equity allocation to the UK (a phenomenon known as home-bias). For those wondering about the effectiveness of this approach, given the size of financial institutions utilising completely different investment strategies, we would point out that we’ve performed particularly well. 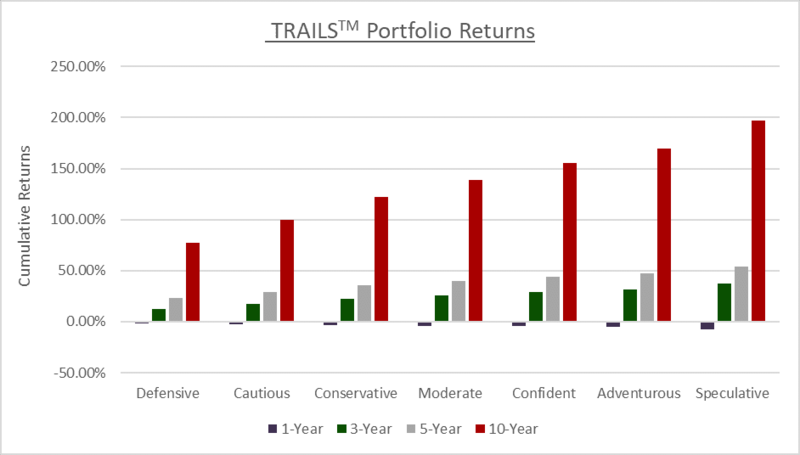 The chart below shows the cumulative returns of the TRAILS™ portfolios, gross of fees and taxes, over 1, 3, 5 and 10 years (all measured until 31/12/2018). Unsurprisingly, most of the portfolios experienced a decline over the past year, however we note that the long-term performance of the portfolios remains strong. 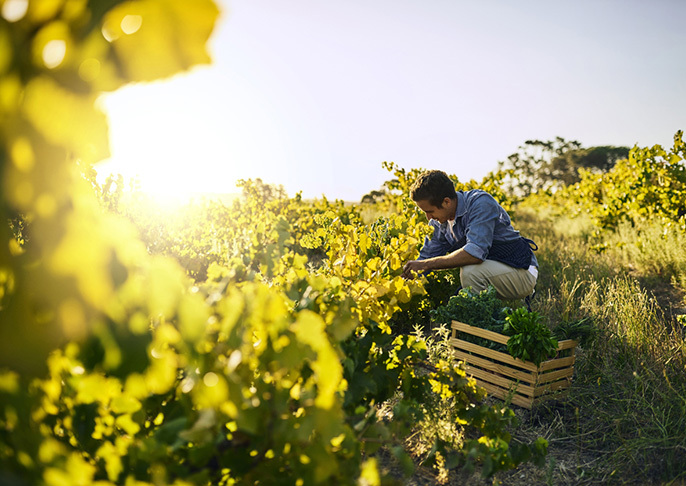 The performance of our portfolios is testament to our investment approach, including many of the aforementioned points about maintaining a consistent, long-term approach to investing.